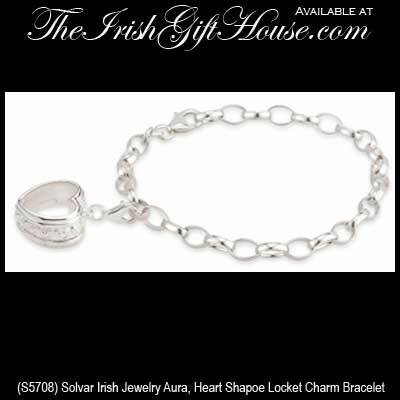 Solvar Irish Jewelry Aura Collection Sterling Silver Heart Shape Locket Charm Bracelet with a Heart Design. The engraved Heart design is continuous around the rim of the charm. 3/4" Wide, Lobster Claw Catch, 7 1/2" Link Bracelet, Gift Boxed. Beads are sold Separately. This unique locket style charm allows you to customize your bracelet for any occasion. Simply pop open the locket charm and place the AURA charms inside. The individual charms are manufactured to sit perfectly inside the locket.